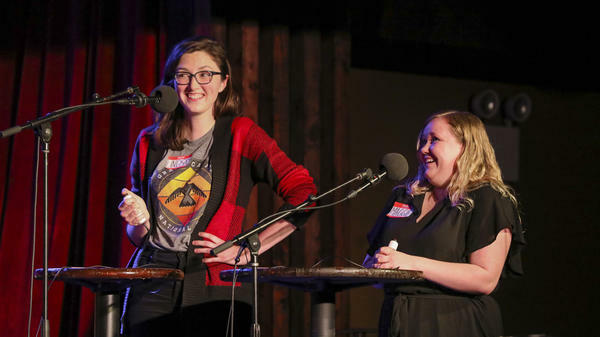 Contestants Lindsay Thompson and Maggie Probst Bussard face off in games on Ask Me Another at the Bell House in Brooklyn, New York. If you've ever played "Operation" and lost, maybe you'll have better luck with this word game where board games are mashed up with body parts. Thank you, Jonathan. Before the break, we met our contestants Maggie and Lindsay. Soon, they'll play a game about board games and organs. It's going to be awful. EISENBERG: Awful. Yeah. First, let's check in with them. Maggie, what board game do you refuse to play? MAGGIE PROBST BUSSARD: I'm really sick of Guess Who? because if you say that it's a woman, it gets rid of almost all of the board automatically. They need diverse Guess Who? EISENBERG: OK, yes, good point. Lindsay, what board game do you refuse to play? LINDSAY THOMPSON: I really hate Settlers of Catan because my brothers are good at it. And so, you know, I'm going to be crushed. EISENBERG: Yeah, you're just going to lose all the time. EISENBERG: It's no fun at all. EISENBERG: So - but you still play? THOMPSON: No, not really. I try to lean it towards Boggle if we can. EISENBERG: Yeah. That's your wheelhouse? THOMPSON: Yeah. Me and Grandma playing Boggle. EISENBERG: (Laughter) Fantastic. All right. Well, this is a word game. And in this word game, we're mashing up board games with body parts. It's called Grey's Monopoly. COULTON: For example, if we said the goal of this game is to line up more than three eyes, lungs, livers, stomachs or any body structure that performs special functions, you would answer Connect Four-gans. EISENBERG: So fun. That's a fun game. And the points are doubled. So remember, the board game will always come first in the mash-up. Lindsay, stay in the lead, and you're in the final round. Maggie, you need to get more points, or in every board game you play for the rest of your life, you have to be the yellow guy. EISENBERG: In this card game, you must announce when you have one card left or you get punched in the sniffer. BUSSARD: All right. Unose (ph)? EISENBERG: Unose is correct. Yeah, fantastic. COULTON: In this raunchy, intentionally offensive card game, you win by playing the dirtiest molars. COULTON: I'm sorry. That's a good guess. You're trying to wedge it in there a little too hard. EISENBERG: You got really specific in a way that I love. COULTON: But I appreciate the effort. Maggie, do you know the answer? BUSSARD: I know it's Cards Against Humanity. I'm trying to figure out the second half of it that's still tooth-related. Cards Against Hu-mandible? No. COULTON: That's a good one, too, but it's also incorrect. EISENBERG: You're both not going to like the answer. COULTON: No, it's very simple. Cards Against Humani-teeth. COULTON: I know. I'm sorry. It was staring you right in the mouth. EISENBERG: In this Rube Goldberg-ian board game, you're a little furball trying to not get caught. If you do, even the large surface muscle that extends from your neck to your mid back won't save you. BUSSARD: OK. So it's Mouse Trap. So - I'm going to going to talk it out. BUSSARD: OK. Mouse Trap - oh, my goodness. 'Cause I want to say trapezoid, and that's a shape. Mouse - I know that the muscles are traps, but I don't remember what that's short for - long - yeah, I give up. EISENBERG: Do you want to say Mouse Traps? EISENBERG: All right. Then you get that. EISENBERG: Yeah, it was - I mean, basically, we were looking for the trapezius, but we also would accept traps. EISENBERG: So Mouse Trapezius or Mouse Traps. That is correct. COULTON: In this war game from 1957, the best strategy is to build your army in the pelvis. Then you work your way up through the rib cage and squash your brother's troops in the clavicle. EISENBERG: They might want a hint. THOMPSON: So the game is Risk. And I have no idea. COULTON: From pelvis to ribcage to clavicle. EISENBERG: I don't know if it's wrong. THOMPSON: I was about to say Risk Intestine, but I know that's wrong. EISENBERG: I just liked that, though. I liked hearing that. THOMPSON: Yeah. Yeah. OK, cool. EISENBERG: That was worth hearing, I think. THOMPSON: It would be interesting. EISENBERG: It would be interesting. COULTON: It would be interesting, but it is incorrect. Maggie, do you know the answer? BUSSARD: I don't, but I'll try. So Risk - I'm thinking like your ribs - Riskcage, like ribcage. COULTON: Riskcage. I like that a lot. Also incorrect. We were looking for Riskeleton. EISENBERG: Good news - 30 questions left. Let's go. COULTON: In this classic battlefield strategy game, each piece represents an army officer, like a marshal, a general or a sergeant. The object is to capture the other player's female reproductive organ where eggs are produced. EISENBERG: This is just a fascinating comment on human reproduction, actually. THOMPSON: The game is Stratego, and it's ovaries. So Strateg-Ovaries. EISENBERG: And your reward is this is your last clue. EISENBERG: You guys did amazing. This was a tough one. EISENBERG: But you did great. You did great. Here's your last clue. Was it Professor Plum in the billiard room with the hanging knob of connective tissue at the back of your throat? EISENBERG: Yeah, you got that perfectly. EISENBERG: What a game. All right. Looks like - Maggie, congratulations. You are going to our final round.